Festive greetings to everyone and a special welcome to all the new subscribers! Jugglemania! – how many objects do you think you can juggle, and for how long? LINK NO LONGER WORKS. Juggling Puppies – It does exactly what it says on the tin! The Amazing Dare Dozen – You really have to time your throws and angles to progress to the next egg basket, so I am counting this as a juggling game! Clowning Around – Balance all those high flying clowns on your Unicycle! Balance! – Use the mouse to keep the ball balanced, avoiding the falling spheres. Stay balanced for as long as possible collecting power ups for extra bonuses! If you know of any more juggling games, then please send me the web address and I will include them in a future issue! Ironically when I typed in the words “juggling games” into google, my website came out in first place! CHRISTmas light switch on’s, and entertaining children who are standing in queues waiting to meet Santa Claus! It’s a great job and I wouldn’t swap it for anything! 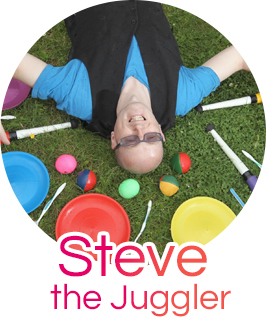 You can find out more about my juggling and circus skills workshops by visiting my Juggler for Hire section. Finally, I just want to wish you and the ones you love a fantastic CHRISTmas, and I look forward to keeping in touch with you throughout 2006 with my newsletters!